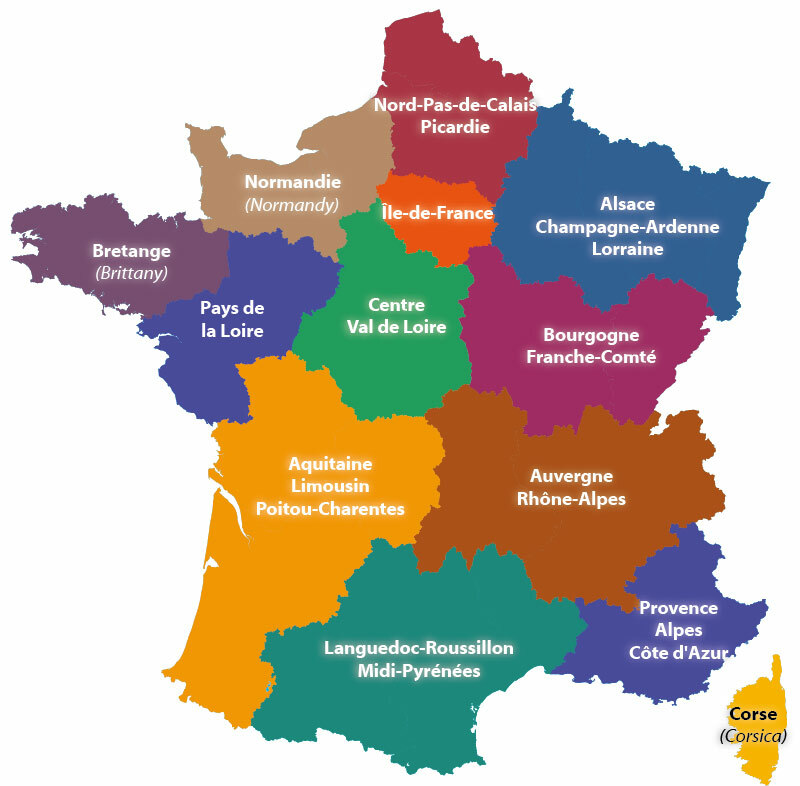 How many regions are there in France? Mainland France is now divided into 13 administrative regions, the governement agreeded on a reorganisation of the country. Metropolitan France is divided into 22 administrative regions, which in turn are divided into departments. Each region has its own character, traditions, cuisine and even French dialects. Countries around the world, plus U.S.A. and individual states. For home access you will need a public library card (Morrill Memorial Library). *Brought to you by the Massachusetts Board of Library Commissioners and Massachusetts Library System with state funds and federal Institute of Museum and Library Services funds. Touristy but lots of information, too. The vast mountain system known as the Alps extends over 600 miles through South France, North Italy, Switzerland, Liechtenstein, Germany, Austria, and Slovenia. It includes several hundred peaks and glaciers, many of which are over 12,000 feet. On this web site, you will learn about how tourism has grown to be the primary industry in many Alpine regions and how this presents challenges to preserve the area's natural beauty and historic charm. You will also learn about the three major divisions of the Alps, and there are links to all the individual peaks with additional information. This article on the history of Corsica is one of the most comprehensive sources that is available online. It begins with information dating back to the first inhabitants of the island and slowly takes you all the way through to its most modern history. Not only does the chronological format make it easy to find and understand the historic events, but the hyperlinks found throughout the article allow you to check selected terms for meanings and descriptions. Lists names and elevation of the peaks in France. You will learn about the folklore of the Brittany region of France on this web site and also read an excerpt from a folktale. Brittany's history is unique because at one time it was a Celtic duchy and then became a province of France.Its folklore includes a blend of British, Irish, and French culture. You will learn that the location of the Broceliande forest of Arthurian legends was actually in Brittany, according to one theory. You will also read about the Breton myth of Ankou, the grim reaper. The French people are passionate about their cuisine and take a practical approach to marriage. While they tend to be polite with everyone, they approach those in their social circle differently. Greetings and handshakes are used universally, but the use of someone's first name and kissing on the cheeks is reserved for family and friends. Learn about cultural etiquette for giving flowers or wine as gifts. Guests at a French dinner party should dress well and arrive promptly. Investigate table manners and business etiquette. Confrontation and high-pressure sales tactics are ineffective, but the French appreciate debate and logical business presentations. Although French cuisine is often thought of as one type of cuisine, there are actually each region of France has its own distinctive cuisine. This brief article explains just what French cuisine is and how French wine plays an important role. You will learn about cuisine bourgeoise and nouvelle cuisine while learning about the defining characteristics of each. A link to French recipes leads you to a selection of recipes that are considered French classics. French culture is rich and diverse. Explore the history and the music of France at this website from Spotlight on Music. Find out about the revolution that changed France from a kingdom to a republic. Learn about the different regions of France and about the traditions and distinctive sounds of each one. Read about the various musical instruments used in French folk songs and find out about French music from the 1950s to the present. The Riviera is a coastal strip along the Mediterranean Sea that has become a major tourist center in Europe due to its mild climate and scenic beauty. Fashionable resorts abound in this region amidst quaint fishing villages and remarkable mountain and coastal scenery. In France, it is called the French Riviera or Cote d'Azur, which means blue coast. In Italy, it is called the Italian Riviera and separated into Riviera di Ponente and Riviera di Levante, eastern and western sections divided by the city of Genoa. Learning the language is not the only challenge to living in a foreign culture. From greetings to business etiquette, the rules are often different than what you might expect. While French people typically greet strangers with a handshake, they might greet someone they have met before with a kiss. When visiting a shop, you are expected to exchange greetings with the shopkeeper. Fashion, wine, and accessories are expected to be good quality. Business meetings are for discussing and debating rather than making decisions. Personal and business lives are kept separate, and first names are only used with friends. Differentiate reality from stereotypes as you learn about French culture. The French have a reputation of being snobs, but that is changing in the global world. Although the French consume a lot of fat in their diets, they have a low incidence of heart disease. The French cultivate quality of life, with at least five weeks of vacation a year guaranteed. Students receive seven weeks off school during the school year in addition to two months in the summer. Investigate French cuisine and traditional dishes. Explore French fashion, philosophy, cinema, and sports. European aristocrats have been spending winter holidays in the French Riviera for more than a century, staying in elegant villas with exotic gardens and playing cricket, croquet, and lawn tennis. Wealthy American entrepreneurs and artists were drawn to the clear turquoise sea and Riviera landscape. Their fairy-tale castles, luxurious yachts, and eccentric antics scandalized and transformed the region and introduced new art, music, and entertainment. Yet, some became unusual benefactors, like one who bought a favorite restaurant and gave it to his waiter after being refused his table of choice. are divided into eight different sections, each ruled by a different country. Here you can learn more about the geography of the Pyrenees. The Pyrénées National Park located along the mountainous border of Spain is a place where people come to experience the natural beauty and wonder of this mountain range. National Geographic will give you a rundown on the features of this park and details about each. You can also read about other information including the seasons as well as what to do there. Romanesque architecture started as early as the 9th century in Europe, although some even claim that it started in the 6th century. It eventually gave rise to Gothic architecture in the 12th century. This type of architecture was the first pan-European architectural style since the Imperial Roman architecture. This style of architecture is simple and functional and it differs based on the region in Europe. Many castles, as well as churches, are built with this style of architecture. Most of the surviving buildings exist in Northern Spain, Southern France, and rural areas in Italy. The region in France known as Southern Burgundy has a large number of Romanesque churches. Romanesque churches such as these are influenced heavily by Roman architecture. These churches were built anywhere from the 11th to the 12th centuries. In this region's Romanesque style the bell towers are simple and square with a cross pointing east. There are also simple wood trusses that support the roof. Here you can view historical and architectural information about each of these churches in this region. Take a stroll through the wildflowers of Provence, France, with over one hundred individual flower pages. You can choose to search the English Name Index, Latin Name Index, or French Name Index. Be sure to check out the purple lavender fields, which cover several regions. A list of trees in the Provence area is also provided, although not all of them have information linked to the names. Another way to view the flora is by color groups: blue, purple, red, white, and yellow, along with a page of orchids.